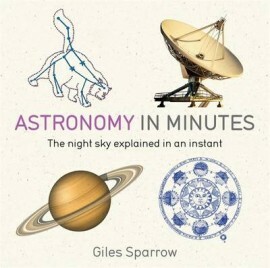 Astronomy In Minutes by Giles Sparrow - spacekids - space toys, dressing up costumes, kids spacesuits, astronaut food, cool space stuff! What happens when a star dies? How many asteroids are in our solar system? Can galaxies collide? What is dark energy? Astronomy in Minutes answers all these questions and more as it condenses 200 key concepts into easily digestible sections. From Trojan asteroids to stellar black holes, and from superclusters to cosmic microwave background, this book will take you on an essential tour around the universe. Beginning with the specks and constellations that we see in the night sky, and then zooming in on the objects and 'matter' beyond the naked eye, Astronomy in Minutes draws on established theories and recent research. Each section is accompanied by an image or a clear diagram to help unravel complex ideas. Beginning with the constellations and finishing with the latest cosmological theories, this is a perfect pocket-sized reference guide to a fascinating subject. This paperback book has 416 pages and measures: 12.5 x 12.5 x 2.5cm.